Star kids are the future of Bollywood and Shahrukh Khan’s children are no exception. Already a fodder for news—AbRam Khan, Aryan Khan and Suhana Khan are shutterbug favourites! So much so that the Khan children have their own fan pages and dedicated following. Photographed where ever she goes, Suhana always seems to be in the limelight. The young diva is often in news for her mesmerising pictures, designer apparel that cost more than most people’s house rent and outings with fellow star kids. Any picture or a video featuring Suhana starts trending in matter of minutes! The short videos all the way from merry old London are no different! In a recent video that has surfaced one can see Suhana giving a hair spa treatment to one of her friends. The short clip shows how engrossed the young diva is in pampering her bestie while another friend seems to be helping them! Isn’t that plain adorable? Apart from being a helping friend, Suhana is also a fun sport! In another short video one can see Suhana playing musical chairs with her friends. First walking around the chairs with caution and later laughing with glee as she runs around a single chair to secure her seat! Just few weeks back Suhana and her girl gang were spotted at Taj Mahal in Agra. Dressed practically in a white-blue kurta, a pair of jeans and sports shoes—Suhana looked like a tourist posing in front of the Taj Mahal. 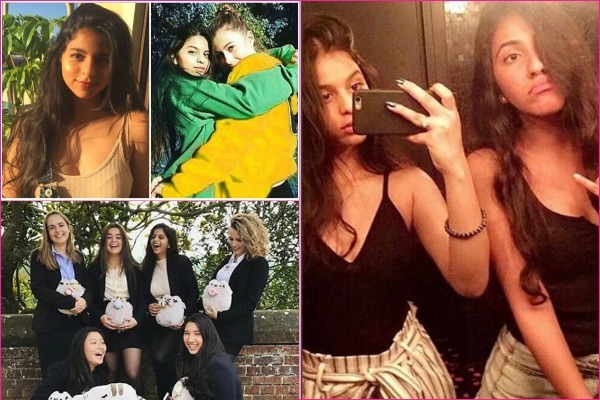 Suhana during the great taj mahal visit with her girl squad the girls are so sweet awhhh ✨⭐ Ps;jus' a short glimpse y'all Vidscreds:@gaurikhan ⭐ @suhanakhan2 love you so much sista ??? All these appearances make us even more eager to see the young diva on the big screen but our hopes have been dashed by King Khan. Earlier in an interview Shahrukh had expressed his opinion that he wishes his children would complete their education before stepping into the world of cinema. Seeing as currently Suhana is still studying in London—Bollywood will have to wait. However, mommy Gauri Khan revealed her daughter Suhana Khan will soon be shooting for a magazine. Choosing not to reveal the magazine’s name Gauri confessed this upcoming event is the one she is looking forward to the most in this year.